How do you sum up the career of Lindsay Whalen? It’s a story that begins in Minnesota, where the Hutchison native burst on the scene by leading the University of Minnesota Gophers to their first Final Four in 2004. It’s also a story that will end in Minnesota, where she has been a centerpiece to the WNBA’s latest dynasty with the Minnesota Lynx since her arrival in 2010. On Monday, Whalen announced that she will retire at the end of the 2018 season – her 15th in the WNBA. Of course, when discussing the end of Whalen’s career, we must specify that it is only her playing career that is coming to a close. She has already begun writing the next chapter in her basketball life as she was named head coach of the women’s basketball program at her alma mater back in April. After a season of juggling double duty between playing for the Lynx and preparing for her first season as coach of the Gophers, Whalen is ready to make the transition to full-time coach. 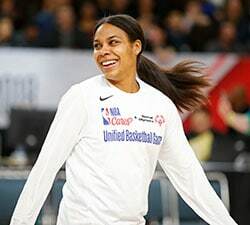 Before that happens, she will look to lead the Lynx toward an unprecedented fifth WNBA championship this September, which would be the ultimate icing on her retirement cake. With such a long and distinguished career as a player, there’s a litany of statistics to illustrate the impact she had on the court. There’s the 2,334 assists (3rd all-time), 5,501 points (14th all-time), 496 steals (14th all-time) and 1,807 rebounds (27th all-time). Or how she became the first player in WNBA history to reach 5,000 points, 2,000 assists and 1,500 rebounds – a testament to her longevity and ability to impact multiple facets of the game. But there is really one stat that encapsulates Lindsay Whalen best. 322 career wins. The most of any player in the WNBA. The first 122 of those wins came during her six-season run with the Connecticut Sun, who drafted Whalen with the fourth pick in the loaded 2004 WNBA Draft. Whalen brought a combination of skill, toughness and relentless determination with her from Minnesota to Connecticut. It’s impossible to count the number of times Whalen drove hard to the basket, absorbed contact and finished with an acrobatic shot. She has highlight reels full of “how did she do that” shots that would make her a nightmare to face in a game of Horse. It took all of one game for Whalen to earn the starting point guard role for the Sun as a rookie. After coming off the bench in her WNBA debut, Whalen began a streak of 475 straight starts; a streak that just ended during Minnesota’s loss to Seattle on Sunday as Whalen came off the bench for the first time as a Lynx on the eve of her retirement announcement. After making the East Finals in the season prior to Whalen’s arrival, the Sun took the next step to the WNBA Finals in Whalen’s rookie season. After winning the opening game of the series, the Sun would drop the final two games as Seattle captured the championship. The following year, Whalen and the Sun ran away with the Eastern Conference, finishing with a league-best 26-8 record and a return to the WNBA Finals. This time, they met the Sacramento Monarchs, who claimed the WNBA throne with a 3-1 series win over the Sun. 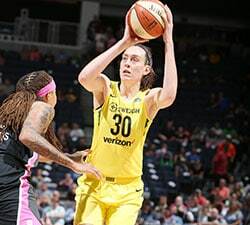 While the Sun would continue to rack up victories – Connecticut finished below .500 just once during Whalen’s six-year run – they would not make it back to the WNBA Finals prior Whalen’s departure in 2010 and have not made it there since she’s been gone. 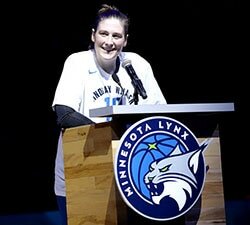 On Jan. 12, 2010, the Sun and Lynx executed a trade that sent Lindsay Whalen back home. The woman that put Hutchison, MN on the map and lifted a struggling University of Minnesota women’s basketball team to the Final Four would now suit for her home state’s WNBA squad. While we now know the Minnesota Lynx as a juggernaut, they were far from that when Whalen joined the team. Since joining the WNBA in 1999, the Lynx had a record of 152-214 (0.415) and just two playoff appearances (and one playoff win) over their first 11 seasons in the league. The Lynx not only traded for Whalen, they also added Brunson in the Monarchs dispersal draft and welcomed back Seimone Augustus, who missed most of 2009 with a torn ACL and missed the first nine games of 2010 following abdominal surgery. And they were playing for Cheryl Reeve, who took her first head coaching job after serving as an assistant for the Detroit Shock during their championship years. Despite the influx of talent, the Lynx struggled in Whalen’s first season, finishing 13-21 and out of the playoffs. That would be the last time she would miss the WNBA Playoffs as the Lynx have already clinched their eighth straight playoff berth. The Lynx won the 2010 draft lottery and received the top pick in the 2011 Draft, which they used to add Maya Moore. The addition of Moore pushed the Lynx talent level to new heights, giving Whalen a point guard’s dream with elite scoring options surrounding her on all sides. Whalen would win her second and third assist titles over the next two seasons, including a career-best 5.9 assists per game in 2011. The 2011 season saw Whalen named to her second of five All-Star teams, earn her second of three All-WNBA First Team honors and, of course, win her first of four WNBA championships. 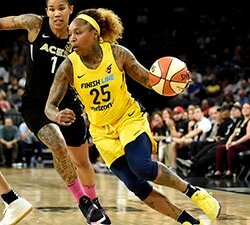 When it comes to winning, the 322 regular season victories and 67.5 win percentage are great, but it is the 54 playoff wins, eight WNBA Finals appearances and four WNBA titles that mean the most. Whalen is tied with Brunson for the most playoff games played in WNBA history as both will add to their 81 games later this month when the 2018 Playoffs tip off. And Brunson is the only player in WNBA history with more playoff wins than Whalen (57-54) and more championships (5-4) as she is the only member of the five-title club. Brunson was a member of the Monarchs team that defeated Whalen’s Sun during the 2005 Finals. Outside of that, the two have been part of the core four that has won the title every other year since 2011 as the Lynx matched the Houston Comets as the only franchise with four WNBA championships. And if winning WNBA championships wasn’t enough, Whalen has also been a member of USA Basketball for many years as she captured gold medals in the 2012 and 2016 Olympics as well as the 2010 and 2014 FIBA World Championships. Whalen has earned plenty of hardware for her individual accomplishments but has always been quick to downplay her victories for that of the team. Which makes the fact that she has more wins than any player in WNBA history the ultimate accolade for Whalen to take with her as she heads into retirement. She is about to reset her wins odometer back to zero as she begins her latest endeavor as head coach of the Gophers this fall.